This insect is a native pest to Apple trees in Saskatoon. This insect has little threat to Apple trees health however does cause fruit to become inedible due to maggots living inside the fruit. This insect will start to emerge from the soil around the beginning of July. Females will lay eggs in developing fruit where the maggot will feed its way into the fruit. Maggots will feed for 3-4 weeks before they are ready for the next stage. When fruit falls to the ground, the maggots will burrow into the soil to complete their life cycle. These will overwinter as pupa until next spring. One generation per year for this insect. The adult will lay eggs on the surface of the apple, causing pitting where each egg is laid. 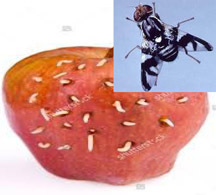 The Maggot will then tunnel through the Apple creating small tunnels which is the most notable damage this insect will cause starting to deform the fruit. We can help you determine the percentage of fruit infected by Apple Maggot and decide whether treatment is advisable. Due to the huge impact this insect can cause over years of infection, it can sometimes be difficult to find a solution to this insect and it’s damage. Implementing an Integrated Pest Management (IPM) strategy is the only way to protect your tree from this insect. This can be sometimes too expensive for the value of the tree or its fruit production. Below we have an example of IPM that can be implemented if the tree is not excessively infected and in good health. Gaining control of this insect will require a treatment or series of treatments. Ask your arborist which ones you require based on a site inspection and quote. Behavioral Control- Placing traps in the tree before fruit production has begun and cleaning the traps until the adult stage is over will further add control to your program helping to eliminate some of the population. This will also allow you to monitor pest populations. Insecticidal Spray- Using Environmentally friendly, selective insecticides or non-selective fruit tree sprays depending on organic production requirements. Insecticidal Spray- Using a broad range, non-selective insecticides for fruit production no later than 2 weeks before harvest. Insecticidal Spray- Using an attractant and insecticide mixture. Soil Drench- Using beneficial organisms to control the pupa stage. Spring fertilizer- This will help promote new growth and increase available resources for tree vigor reducing stresses and helping maintain a healthy tree. 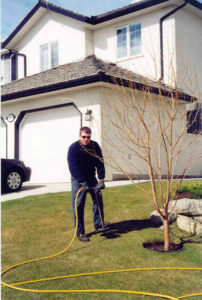 Other pests- Controlling other pests that interfere with tree health is important. With other pests compounding stresses the tree may succumb to these stresses before control is achieved. Example: Forest Tent Caterpillar, Aphids, scale. Pruning- Including thinning the canopy for light penetration, shaping the tree and doing reductions to regulate tree size for quality fruit production. *Talk to your Plant Healthcare Technician to have them help you select an appropriate package for your tree as treatments may change depending on circumstances. You and your neighbors- The adult Apple fly is capable from moving from one tree to another. If your neighbors have apples please have them informed of this issue as their tree can be problematic for you. This also applies to your property if you have trees that are untreated or not quarantined. Self-monitored- Monitoring to establish effectiveness of treatments is important and requires some form of trap. Suggested is a red orb trap you can get from your local garden store or nursery. Perhaps your arborist has given you one or it was included in your package. Noting how many adults are on this orb at the end of each season will help your arborist assess effectiveness of treatments and future requirements. This can be done professionally for you. This pest may take several years to fully control to an appropriate level. Please keep in contact with your plant healthcare provider as they will adjust treatments and longevity of treatments as required. 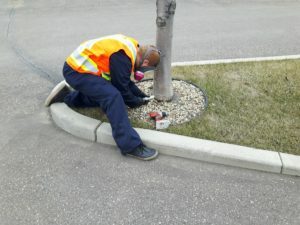 Depending on the populations in your area, treatment length can change but this is expected in Saskatoon indefinitely as it is a native pest. Treatment until surrounding trees are either treated and clear of Apple Maggot, or removed is a must however treatment types may change depending on severity, fruit production requirements and location. To request a quote online please click here.